so, what should i do from here? Re: [WIP] Jean Grey as The Phoenix - Help me with the shading! I hate to say this, but if you're practicing something basic like shading it's probably a good idea to start with some smaller pieces first. 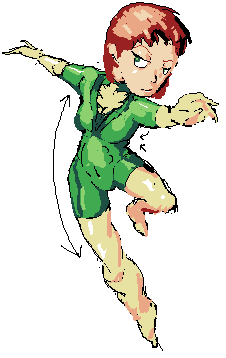 Doing a piece this large in pixel art is just a lot of work, which isn't super ideal for a practice/learning piece. On a more general note, I'd suggest you look at some reference images. Decide what materials she's wearing and look at how light reflects off of them. Also make a decision as to where the light is coming from and stick with it. It looks like she is backlit based on the areas you have started, which would put most of her front in shadow (probably not ideal from a compositional standpoint). But yeah, a piece like this for practice could really be a frustrating experience for you. Redshrike makes some excellent points. If shading is difficult, you need to begin with the basics. Cubes, cylinders, spheres. If you can't shade them, you can't shade anything. Make sure you're thinking about the subject in terms of 3-dimensional form. Break the subject down into more basic forms to understand what exactly it is doing in space and how see how the surface is moving through perspective. Once you work this out its pretty easy to decide "this part of the surface is facing the lightsource, this part is in shadow". If you can't do that, once again you need to go back to basics. Where's the flow? 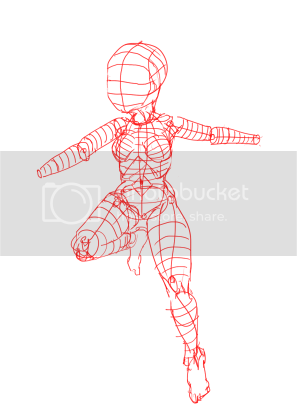 Your figure is essentially bolt-upright with limbs splaying out at arbitrary angles (in fact it kind of looks like she's showing off her body in an act of sexual enticement). 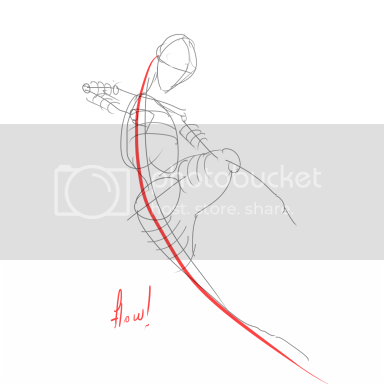 Note the red line of action in my gesture sketch. See how it influences the tilt of shoulders and pelvis, the angle of the spine, the turn of the torso in perspective away from the viewer. These things create much more interest and bring a movement of line to the figure, giving it life. Lol, another one of these? Okay, I have... this. Basically taking EyeCraft's advice. New pose was based around a gesture sketch, but I pretty much screwed up her likeliness. Oh well. The pose was the point of this after all.